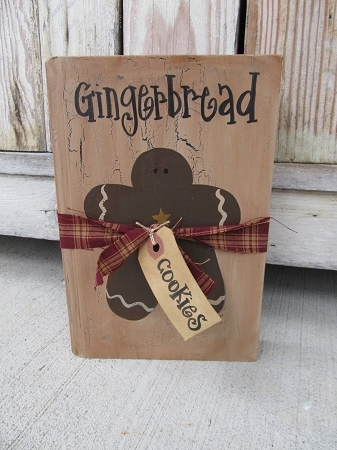 Primitive Country Gingerbread Cookies Tied Hand Painted Vintage Book. A great accent for your kitchen or home decor. I've taken a vintage book and hand painted on this gingerbread man. 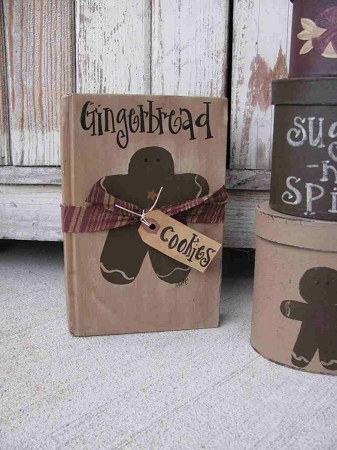 I wrote Gingerbread up above, tied the book shut with a burgundy and tan homespun tie and added a primitive tag that reads Cookies. The books are vintage recycled books so the sizes vary but mostly are around 5"x7" This is a great design for everyday or the winter holiday! Hand painted, designed and signed by Heidi.